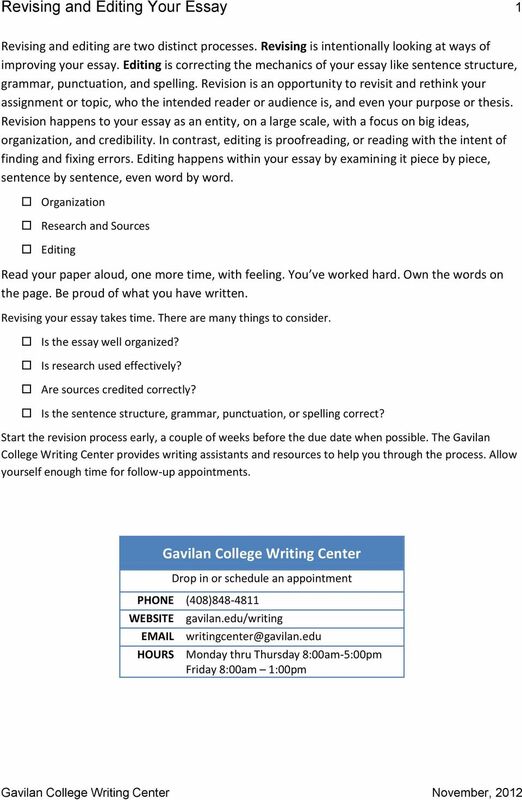 Download "Revising and Editing Your Essay 1"
2 Revising and Editing Your Essay 2 Organization Revision takes time. If possible, begin the revision process a week or two before your paper is due. Build the time necessary into your schedule, including at least a day or two away from your essay. This helps to create distance between you and what you have written, helping you read it with a fresh set of eyes and more objectivity. Read your paper aloud. Read it to yourself. Read it with a pen in hand. Read it to another person, your pet, a nearby plant, or your favorite stuffed animal. Come to the Writing Center and read it to a Writing Assistant. The point is, read your paper aloud. You use a different part of your brain for seeing, speaking, and hearing, so by reading it out loud you engage parts of your brain that aren t familiar with your paper. Create a reverse outline. 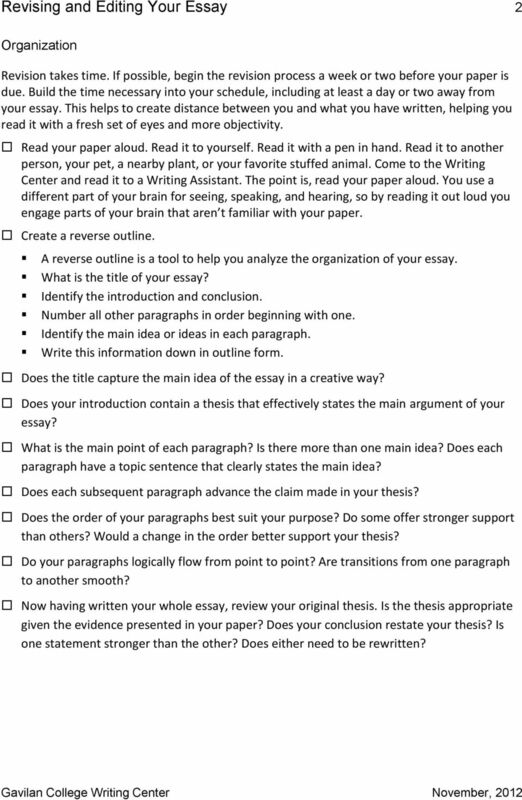 A reverse outline is a tool to help you analyze the organization of your essay. What is the title of your essay? Identify the introduction and conclusion. Number all other paragraphs in order beginning with one. Identify the main idea or ideas in each paragraph. Write this information down in outline form. Does the title capture the main idea of the essay in a creative way? Does your introduction contain a thesis that effectively states the main argument of your essay? What is the main point of each paragraph? Is there more than one main idea? Does each paragraph have a topic sentence that clearly states the main idea? Does each subsequent paragraph advance the claim made in your thesis? Does the order of your paragraphs best suit your purpose? Do some offer stronger support than others? Would a change in the order better support your thesis? Do your paragraphs logically flow from point to point? Are transitions from one paragraph to another smooth? 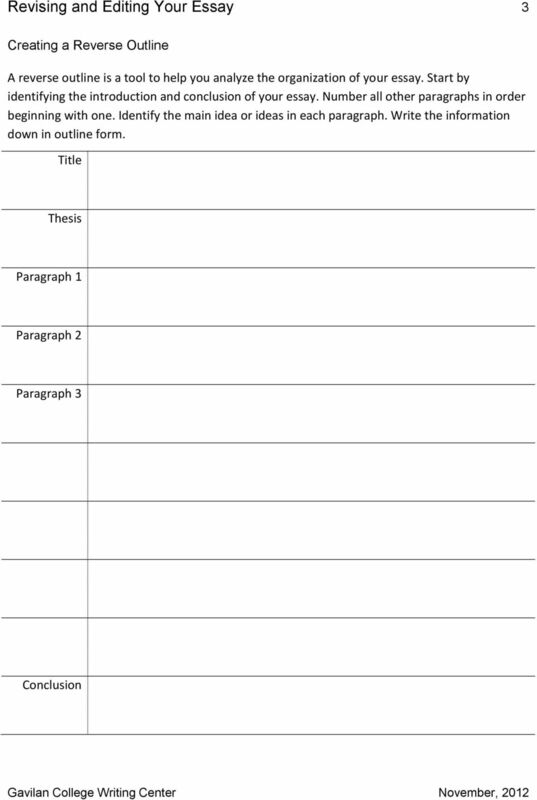 Now having written your whole essay, review your original thesis. Is the thesis appropriate given the evidence presented in your paper? Does your conclusion restate your thesis? Is one statement stronger than the other? Does either need to be rewritten? 4 Revising and Editing Your Essay 4 Research and Sources Using research effectively in your essay lends credibility to your thesis and supporting ideas. Pay close attention to how you incorporate research. Overuse of quotes, ineffectual paraphrasing, and inadequate summaries can have unintended consequences. They detract from your ideas, making the paper sound like someone other than you wrote it. Worse yet, they can result in plagiarism. Read your paper aloud. This time, listen carefully to who is speaking. Does it sound like you or is your voice being masked by the voices of your sources? Incorporating your research (Quote Sandwich): Have you introduced your research using signal phrases, a phrase that leads into a quote, statistic, or idea from another source? After including a quote or paraphrase, have you commented and expanded on the research to demonstrate how it supports your ideas? Analyzing the evidence: Does your research support your thesis? Have you used direct quotes sparingly? Have you effectively paraphrased or summarized points made by your sources? Do you hear your voice? Have you used your own words and sentence structure while maintaining the integrity of the source s idea? Documenting your sources: When it comes to documentation, don t rely on your memory. The rules for documentation are specific and change over time. Refer to a current handbook or online resource like Purdue OWL often. Have you credited your sources and formatted your citations correctly to avoid plagiarism? Do the sources cited within the text of your essay match exactly the sources listed on your Works Cited page? Is the formatting and content of your Works Cited page precise and correct? 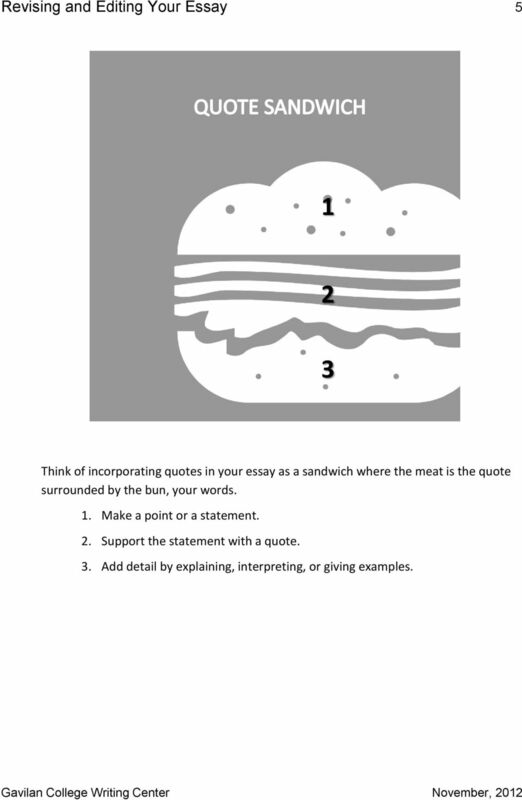 5 Revising and Editing Your Essay Think of incorporating quotes in your essay as a sandwich where the meat is the quote surrounded by the bun, your words. 1. Make a point or a statement. 2. Support the statement with a quote. 3. Add detail by explaining, interpreting, or giving examples. 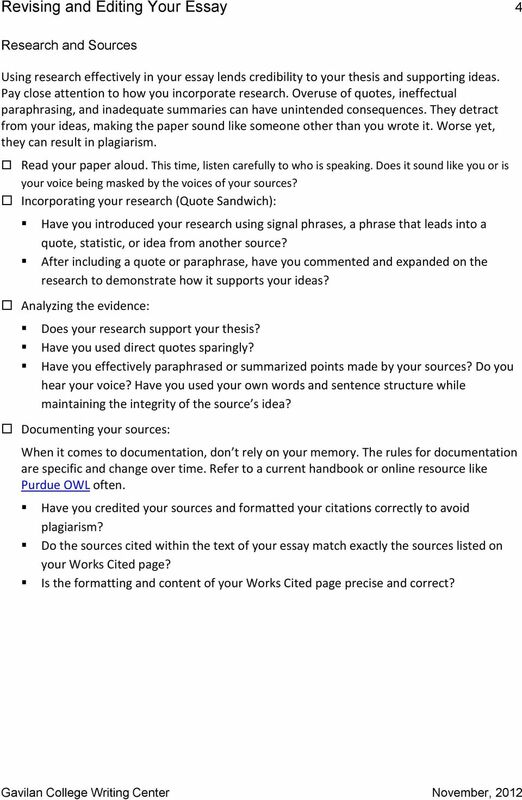 6 Revising and Editing Your Essay 6 Editing You have finished revising your essay organizationally and assuring your reference material is effectively folded in with your ideas. Now it is time for editing. 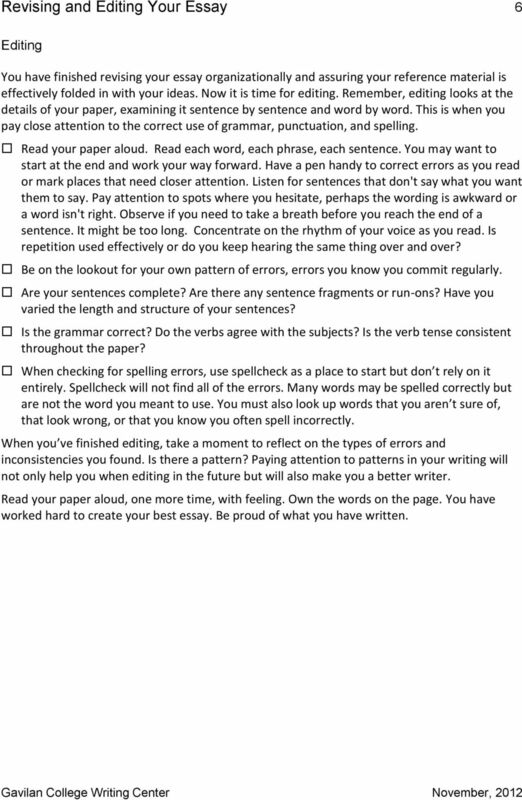 Remember, editing looks at the details of your paper, examining it sentence by sentence and word by word. This is when you pay close attention to the correct use of grammar, punctuation, and spelling. Read your paper aloud. Read each word, each phrase, each sentence. You may want to start at the end and work your way forward. Have a pen handy to correct errors as you read or mark places that need closer attention. Listen for sentences that don't say what you want them to say. Pay attention to spots where you hesitate, perhaps the wording is awkward or a word isn't right. Observe if you need to take a breath before you reach the end of a sentence. It might be too long. Concentrate on the rhythm of your voice as you read. Is repetition used effectively or do you keep hearing the same thing over and over? Be on the lookout for your own pattern of errors, errors you know you commit regularly. Are your sentences complete? Are there any sentence fragments or run-ons? Have you varied the length and structure of your sentences? Is the grammar correct? Do the verbs agree with the subjects? Is the verb tense consistent throughout the paper? When checking for spelling errors, use spellcheck as a place to start but don t rely on it entirely. Spellcheck will not find all of the errors. Many words may be spelled correctly but are not the word you meant to use. You must also look up words that you aren t sure of, that look wrong, or that you know you often spell incorrectly. When you ve finished editing, take a moment to reflect on the types of errors and inconsistencies you found. Is there a pattern? Paying attention to patterns in your writing will not only help you when editing in the future but will also make you a better writer. Read your paper aloud, one more time, with feeling. Own the words on the page. You have worked hard to create your best essay. Be proud of what you have written. what a basic essay/written response is. the steps of writing an essay. what an essay consists of. helpful transition words. why it is important to support your thoughts. why you should proofread your essays. Writing a Research Paper. a. It is a written document primarily used in academic settings. SCIENCE PROJECT PAGE 1 Introduction YES!!! It s that Science Fair time of year. No amount of groaning is going to make it go away. Just imagine the inquiry and organizational skills you ll learn and practice. Essay Writing. Learning Development Service 22 nd of October Leonie Maria Tanczer, MSc. Plagiarism and How to Avoid It Success Center What is Plagiarism? According to Aaron (2007) in The Little, Brown Compact Handbook, the word plagiarism derives from a Latin word meaning to kidnap or abduct. What is Expository Writing? It is a piece of informational text, that explains something to the reader. By the end of this activity you should be able to explain what is meant by plagiarism.